Home Theater Antique Popcorn Popper - 8oz. Home · Bowls & Party Supplies · Commercial Popcorn Poppers · Home Theater Antique Popcorn Popper - 8oz. Product Reviews for Home Theater Antique Popcorn Popper - 8oz. Entertain at home in style with this Whirley Pop ™ Professional 8 oz. Popcorn Machine. This is the big brother of the "4 oz" home theater poppers as featured in "Maxim" Magazine and USA Today. Makes 1/2 pound of popcorn at at time. Make your Home Entertainment Center...the center of attention! Wonderful for making large quantities of Real Theater popcorn and keeping it hot and fresh with the built in heat lamp. The tantalizing aroma of fresh popped popcorn will make you and your friends feel like your really at the movies. 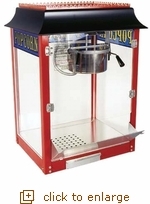 The 8oz popcorn machine can produce 147oz of popcorn per hour and is ideal for use in social clubs, schools, large concession stands, video stores, larger break areas, restaurants, country clubs and waiting rooms. This popper will ship in its own box and will be shipped by UPS ground residential only, NO express shipping. Check out the accessories for this popper in our Accessory Department. Make your popper mobile by combining it with the "medium" matching cart. Each cart includes storage area for ingredients and a removeable shelf.